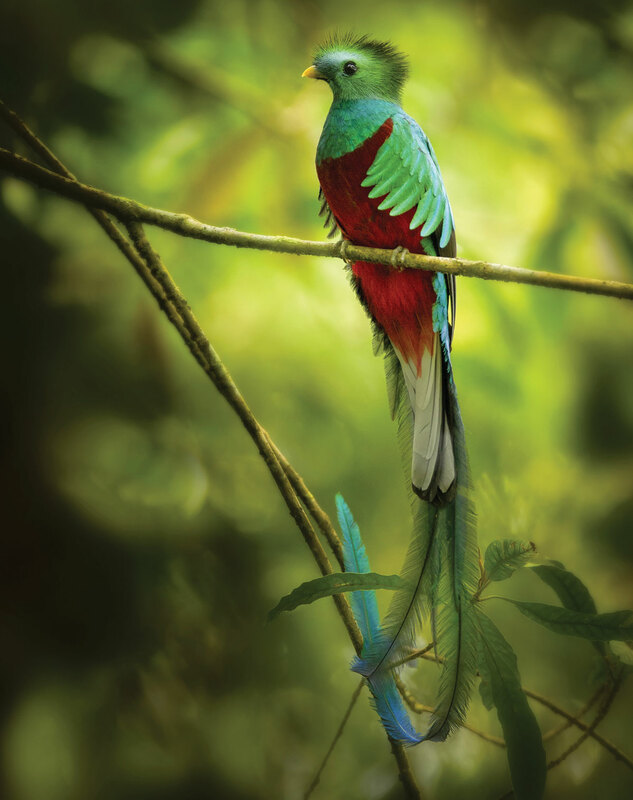 Resplendent Quetzals are startling emerald jewels of the cloud forest. They shimmer from one shade to another, blending almost magically with the wet green background of their constantly misty high altitude homes. Their color seems ephemeral for a reason; quetzals are not green at all. It’s hard to believe, but quetzals are actually brown. They are colored by melanin, the same pigment that causes tanning in humans. Highly magnified, quetzal feathers are alternately translucent and dark brown. The magic comes from melanin pigment stripes regularly spaced 5,400 angstroms apart causing interference that “traps” most colors of light but reflects green light, which bounces back to your eye. A similar interference pattern with different spacing on Morpho butterfly wings are what make them appear blue. The optimal viewing season corresponds with the breeding season which varies from February through July over the quetzal’s range in the mountain cloud forests from Southern Mexico to Panama.